Binding - doesn't the stitching show through? Thread: Binding - doesn't the stitching show through? I know this is a silly question, but every quilt I finish I struggle with the binding. If I sew to the front (face down to hide the stitching) the roll the binding to the back to sew on I get frustrated. I have hand sewn with a blind stitch many times, but I am working a big project and I have 5 more quilts to bind... I want to sew with the machine. Then I feel like they will stay on better and it will be quicker. But the stitching will show on the other side if I use my machine. What do you guys do about that? Do you just let it show? One technique is to sew the binding to the front, carefully fold over and glue the binding to the back so that the edge just covers the stitch line, then stitch from the front in the ditch while the glue holds the binding in the right place. This stitching will just catch the edge of the binding on the back. Another technique is much the same, except that you zigzag the seam allowance with fusible thread, and then instead of using glue you just iron the binding onto the fusible thread, then stitch in the ditch from the front. In either case, your final stitches do show on the back of the quilt, but not on the front, because they're in the ditch. On the back they are supposed to be nice and even because you've used glue or fusible to hold the binding in just the right position. I've tried the glue method and it worked okay, but I still prefer to bind by hand. My friend has used the fusible thread very successfully. You can machine stitch binding to the front and back at the same time. It helps to use a glue stick and glue it down first. Your binding strips should be folded over, wrong sides together and ironed. Then you fold both left and right side towards the middle and press again. You sandwich the edge of your quilt in between and off you go. I also have a foot for my machine for this technique but have never used it. Glue and a walking foot work just fine. Good luck! I stitch the binding on the back and fold over to the front and top stitch. It looks nice. Does it matter if the stitching shows? I use the same color thread as the backing on the bottom and the same color as the binding on the front. I have sewn it to the back and brought it to the front. Then I use a decorative stitch to sew down the binding. It is meant to show and I just call it a feature! One option if you don't want it to show: Use wash-away thread and large stitches to sew it down - then check where it is off and make adjustments. As long as you sew it down with a matching thread, it shouldn't matter. Most of the time I sew mine down by hand in the back - even the large projects. This is what I did - the stitching DOES show on both sides - but I tried to make it fairly consistent - the green and black are the back sides. I think it comes down to what you can live with. The stitching will show on one side or the other if you do it by machine. Does it matter? To me the answer is sometimes yes, sometimes no. Super special quilts get hand stitched binding. Others get machine sewn binding. We often make an effort to make quilting stitches show up, so why is it so taboo for binding stitches to show? Here's one of the best tutorials I've seen on binding by machine (or hand). If I am going to do a machine sewn binding, I like to use Charisma's QB tutorial under Quick machine binding with flange. You make a 2 tone binding that is sewn to the BACK of the quilt and the binding is folded to the front and I stitch along the flange with a thread that blends with the back. It gives a great finish and an added detail with the flange. When I have hand stitched bindings to the back, I have used a simple overcast stitch (with an extra knot every 4 inches or so) with a single strand of thread. I would go bonkers trying to do a blind stitch, it is so slow and tedious for me. Sure, the overcast stitch shows a little, but I consider that part of the charm of hand stitching! My overcast stitches are between 1/8 and 1/4" apart with thread that matches the binding. This is plenty secure, plus easy to fix if a thread should break (because there is typically only a 4-inch stretch that needs repair), although I've never had a thread break. But, now I do most of my bindings by machine. It does not look as neat as my hand bindings, but it's plenty good for the bed quilts I like to make. I am convinced that no one but another quilter will ever examine my bindings to see how well I did them! Most people are just delighted to have a quilt. It did take me quite a bit of practice and development of technique to get my machine bindings to where I actually like them. They are still not perfect, but much better than my first one. Still, the first one was good enough for the quilt and doesn't bother me anymore (no one else in my family would notice). Edit: I want to mention that machine bindings are much easier if your machine has a decorative stitch that does not have a center line down the middle -- e.g., a feather stitch that varies to both right and left. When you use this on the front of the quilt it does not matter if you are off a little; it will still look good on both sides. There are other techniques that help a lot too. Ironing the binding away from the quilt body before turning the binding helps more than you would think to get a straight binding on the other side. Also, Elmer's washable school glue is wonderful for securing the binding before sewing. Last edited by Prism99; 08-08-2013 at 08:31 AM. Tashana: I have sewn the front and back together in the technique that you describe. That is when I have my best results - - except for the corners. I like nice corners and I cant get them very easily when I do it like that. Do you know any tricks to help with those corners when using this technique? I machine stitch my binding to the back, fold it over to the front. I hand sew all my bindings this way. It gives me something to do while watching tv. 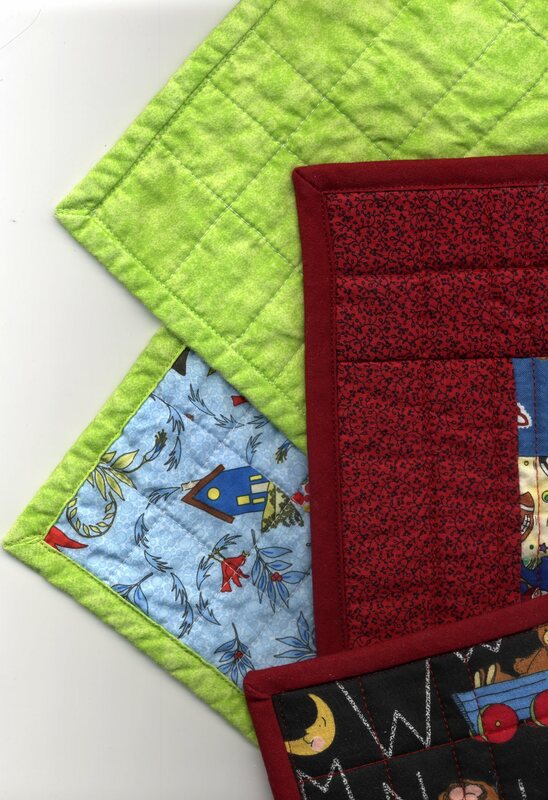 I save up a few quilts this way when we watch our favorite tv series on box sets. In order to get nice corners, make sure to stop sewing slightly before the 45 degree line. If you cross that line, there goes your nice corner. I use the Perfect Binding Miter to mark that 45 degree line and it really helps. Edit: Also, make sure to square up your quilt before you sew the binding on. I do think that hand stitching on the back holds up. Just knot the thread every 4 inches or so. That way, if a section does come out, it's very easy and quick to repair. That's what I did on my last quilt (only I used pins to hold it-I pinned it right in the ditch and took them out as I sewed). I plan to do the same from now on. that's how I do my binding sew on front then glue back and st in ditch from the front good idea for the fusible but would the zigzag interfere with the miter in any way? I'm going to try this,I have a small wall hanging ready for binding and I have fusible thread do you put it in both top and bobbin? A long time ago I put up a tute - written only - on binding with your machine. I sew the binding on the back. Then I iron it flat, going away from the body of the quilt. Next step is to iron it over onto the front. You can use a glue stick, glue, or whatever, even nothing. Last step is to use a fancy stitch to attach the binding on the front. I like what I call the chicken feet stitch. Using the thread color of choice so it looks nice w hen finished. Thank you for the link to the flange binding!!! I machine all my bindings. Some to the front and some to the back and I have no trouble with seeing the stitching. After all you can see the quilting stitches. Do what pleases you. You can go to page #2 of this thread and gale has put a direct link in green letters that will take you right to it OR you can type in Quick Machine Binding with flange in the search bar at the top of this site. The search bar will bring up all similar threads and then you look for Charisma's name. busy fingers: good point... the quilting threads do show through. never thought of that. Thank you everyone for your thoughts.